S.P. Sullivan is a 2010 graduate of the UMass journalism program. Upon graduation, he took a job as a producer for MassLive, the online operation of The Springfield Republican. I was chatting with him online prior to Wednesday’s tornado and caught up with him to see what the past several days have been like. 1. Where were you when the tornado hit Springfield? What did you do? When the first tornado hit I was in the office. I stuck around because I have a little car and I didn’t want it to blow away during the NWS’ tornado watch. We saw the tornado pass a few blocks from our building, tearing debris off the tops of buildings, but honestly I wasn’t that impressed. Even when our general manager came back from a meeting with photos of a few uprooted trees downtown, I didn’t think it was anything more than the microbursts that sometimes happen around here, destroying a random barn and leaving everything else untouched. So I left! I don’t think I’ll ever forgive myself for that. I went grocery shopping. But there was no way to know the extent of the damage at that point, and I couldn’t get downtown because of gridlock traffic in that direction. It wasn’t until I got home that I heard about the level of damage. So, jaw ajar, I went back to work from my dining room table. 2. Were you surprised by the amount of devastation in Springfield? I don’t think I’ll ever forget what I saw. 3. Describe what you did during coverage on Wednesday and Thursday? Because I was 40 minutes away in Amherst when I started working on tornado coverage, I did a lot of back-channel stuff Wednesday night. I’m a producer, not a reporter, so the paper had reporters all over the scene. I tried to flesh out details of what happened from the streams of media reports, the chatter online and communicating with other staff. I made sure the latest stuff was on the homepage as it was coming in and added all the necessary media. Then, I started recording statements from the governor and other officials remotely using a complicated set-up involving my smartphone, a Zoom H2 recorder and a stereo cable. Because of that I was able to listen in on the governor’s press briefings and file stories on the site about the state response within minutes of them ending. I edited and embedded audio from those briefings. Most of Wednesday night I was glued to Twitter on the back end, trying to vet information as it was coming in and post stuff as soon as it was confirmed by us or our media partners. Thursday, I came in early and started out with my normal morning routine, which is manning the homepage. I built what we call a ‘defcon’ promo, which is a module that we roll out for large, breaking news events like this one. Then I worked with a reporter at the paper on a live blog, bringing together dispatches and photos from reporters in the field, user-submitted photos and video and updates on traffic, office closures and whatnot from state agencies. In the afternoon, I was sent out in the field to capture images and on-the-ground perspectives of the recovery process. I visited the badly damaged South End and talk to a security guard from one of the towers, who had helped his tenants to the shelter at the MassMutual center. I got yelled at by cops and National Guardsmen for crossing police lines, and told by others that I was OK as long as I had my press badge. It was a confusing time, and I was struck by the number of people wandering the South End, taking pictures of the damage with their cell phones. Between disaster areas, I found some women flagging down cars for a car wash to raise money for victims. A few of them had been impacted themselves. I thought it was a touching story and, for our readers’ sake and mine, I shot some video so we’d have a positive piece to balance out the desperation. 4. Describe the role of social media in your reporting. I got on Twitter as soon as I knew it had happened because I have a decent base of followers in Western Mass. I knew they would be posting about the situation wherever they were at. It’s also useful as an aggregation tool, because it would take me 30 minutes to sift through all of the state’s news organizations that were covering this, but as everyone was sharing from their news site of choice, I was able to see headlines from all over in real-time. Twitter was most useful in the hours right after the storm hit, and I keep checking it to this moment, but since Wednesday night I’ve mostly been using it to keep our 3,000+ followers up on what we’re doing, what other orgs are posting and what the various state agencies and aid groups are saying. I posted updates from the field, but that was somewhat difficult with spotty reception due to downed cell towers. 5. What has surprised you most about the coverage of the tornadoes? It’s a friggin’ tornado in New England. Everything about the past 48 hours has been surprising. If I have to pick, I’d say the courage of the folks like the women I met at the car wash, who managed to remain positive amid all of the rubble. This entry was posted in Blogging, Facebook, Future of Journalism, images, In the News, Journalism Major, MassLive, S.P. Sullivan, Social Media, Springfield Tornado, Teaching, Twitter, UMass Springfield Tornado, video, Web journalism and tagged Blogs, citizen journalism, Facebook, innovation, Journalism Department, MassLive, Multimedia, S.P. Sullivan, Social Media, Springfield Tornado, Twitter, UMass Springfield Tornado, video. Bookmark the permalink. Pingback: S.P. 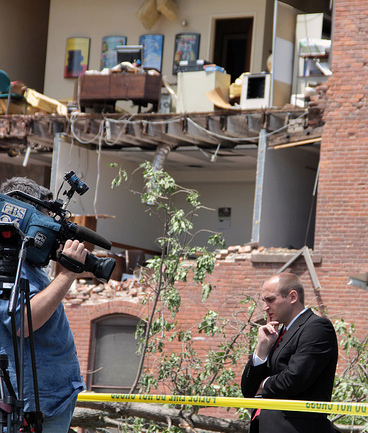 Sullivan Media | Journalism in a bag.» Blog Archive » Covering the tornadoes in Springfield, Mass.